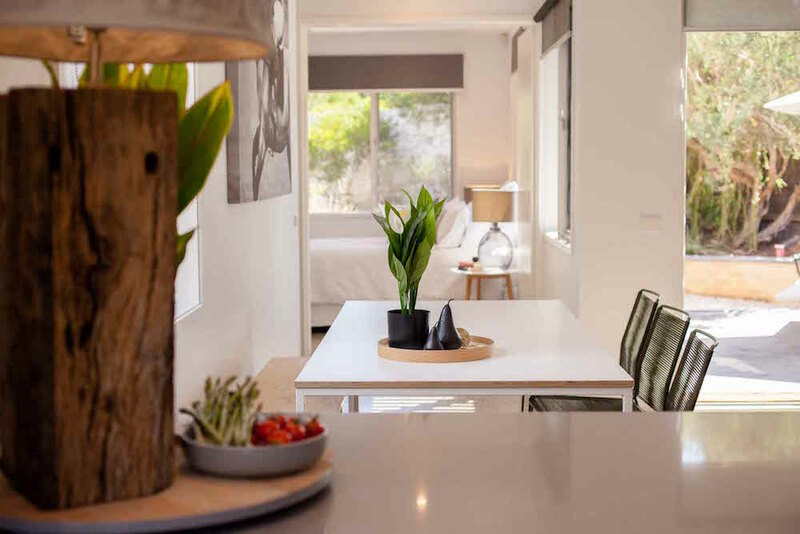 White Horses is a freshly renovated three bedroom modern beach house just a stones throw from St Andrews Beach in the Mornington Peninsula. This stunning beach house on the Mornington Peninsula has recently been transformed into a glamorous holiday rental. Located at St Andrews Beach, close to the ocean's edge and a stones throw to the National Park and beach. Behind the unassuming façade you'll find stylish interiors chosen to create a glamorous monochrome style with layers of textures to make you feel warm and welcome. This three bedroom two bathroom single level house has polished concrete floors throughout, keeping the house cool in summer and warm in winter. The central lounge has a gas log fire and 65" flatscreen smart tv and opens out to a central courtyard ideal for alfresco dining. The newly renovated kitchen boasts stainless steel appliances and Nespresso coffee machine. The house is split into three distinct areas with two bedroom and bathroom wings either side of a central living space. The master bedroom has a king bed and private ensuite with bathtub. The second bedroom wing has a further two bedrooms, the first with a queen bed and garden aspect, the second with a tri-bunk and foldout bed for extra guests. These two bedrooms share a large second bathroom and integrated laundry. The holiday house is completely fenced for security and privacy and is also pet-friendly. White Horses holiday house welcomes pets by prior arrangement. Pets are welcome inside but are not permitted on furniture or beds. Please note, this is self catering accommodation therefore the house is not serviced on a daily basis. However, all linen, towels, basic kitchen provisions and toiletries are supplied for your arrival. White Horses beach house is the perfect retreat for couples, families or small group getaways. Additional terms and conditions will sent to confirm your booking. You give us pre-authorisation to debit your credit card up to $1000.00 should we need to without notice to remedy any damages or repairs replace missing household items as a result of excess cleaning the removal of garbage and debris from the property to recover expenses as a result of excessive usage or as a result of breaches of the terms and conditions. In the event of an account being in default and being referred to an external party for collection the customer shall be liable for all resulting costs arising from the recovery including commission which would be payable if the account is paid in full and legal costs including demand costs. We strongly recommend that you obtain travel insurance and will not be held responsible for costs loss of deposits and payments made or other fees incurred due to cancellations resulting from but not limited to acts of terrorism act of God war strikes theft delay cancellation civil disorder disaster Government regulations or changes in itinerary or schedule or from any occurrences or conditions beyond its control. If you need to change your booking for any reason given 30+ days notice you can however transfer your booking to new dates or transfer them to other nominated guests. (for Peak Season bookings 60+ days notice is required). White Horses is a three bedroom house, featuring within the master bedroom a king bed, fitted robes, 32" flatscreen smart TV, and a private ensuite with shower and bathtub. The second bedroom wing has two further bedrooms with fitted robes, the first with a queen bedroom including a 32" Smart TV, and the second is a Tri-Bunk with a foldout bed for extra guests. These two bedrooms share a large second bathroom with integrated laundry facilities. The central lounge is focused around a gas log fire over which hangs a 65" flatscreen smart TV. The kitchen includes stainless steel appliances including a fridge-freezer with water cooler and ice maker. There is also a Nespresso coffee machine. Car parking is available for four cars in the driveway. Pets are welcome inside however please bring your own bedding and bowls. *Pets are permitted, however not on furniture or beds. There is a strict no party policy at this property. Please note there is a $2000 security bond, which must be organised directly with the property before arrival.